Master the answers for your boards and wards! Medical students have no time to waste. 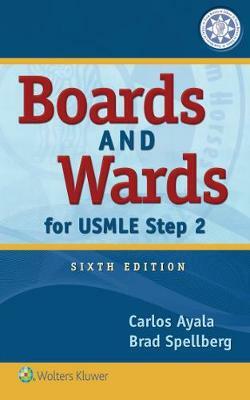 Boards and Wards for USMLE Step 2 is the solution! Updated to reflect the current USMLE Step 2 test blueprint, and organized to parallel the clerkships that all 3rd and 4th year medical students are required to take, this bestselling resource makes it easy for you to study only what you truly need to know for the USMLE as well as end-of-rotation exams. -Study on the go thanks to a portable format that's ideal for clinical rotations. -Efficiently master the essentials through focused coverage of frequently tested topics, presented in a succinct, organized manner. -Test your knowledge with 100 USMLE-style questions inside the book - with answers and rationales. -Boost your test-taking skills with a new feature on USMLE "Pearls." -Grasp facts quickly through at-a-glance color graphs, tables, charts, and algorithms. -Easily look up rare diseases in a "Zebras and Syndromes" appendix.